The Nishkam Centre welcomed Communities Minister, Baroness Hanham to see first-hand a project that benefited from European Regional Development Fund (ERDF) money to support small and medium enterprises, regenerate the local community and create jobs. 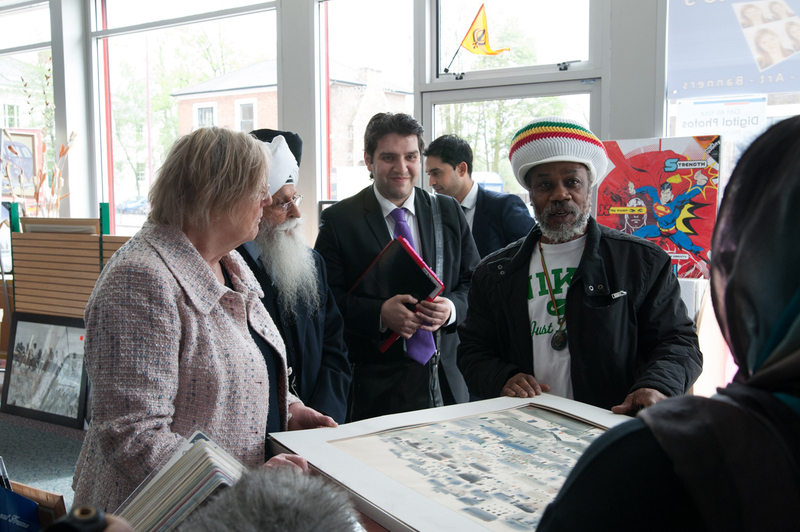 On a tour of the Nishkam Centre, Baroness Hanham met residents, entrepreneurs and businesses who have benefited from the multi-purpose community hub which offers support in the areas of training and education, health and wellbeing, youth and community activities, economic development, civic and interfaith engagement alongside inspiration through its widely recognised Anglo-Sikh heritage exhibitions. The £6m+ construction cost of the Nishkam Centre project was funded 33% by ERDF (£2.54m) and 67% from the parent organisation Guru Nanak Nishkam Sewak Jatha (GNNSJ) and the congregation. During construction a staggering £4m+ came from community donations and support from GNNSJ. In addition, volunteer input of 110,000 hours was valued at around £1.5m. This major collaboration between a faith-inspired organisation, public agencies and the local community has shown what is possible when the right partners come together. The landmark project has made a significant impact in a deprived inner city region. Communities Minister Baroness Hanham CBE said: “For over a decade, European Regional Development funding has made a real difference to the economy and lives of people in the West Midlands. Regenerating communities, supporting local enterprise and local people through new jobs and opportunities, are key priorities for this vital funding Programme. “It is great to be able to see how an ERDF investment made over 10 years ago is still thriving, providing a lasting legacy and continued support through the centre for local people. In just five years of operation, the Nishkam Centre’s successful engagement with local social capital to deliver innovative education, training, health screening, wellbeing, art and heritage, interfaith and civic engagement has been acknowledged as a model of best practice for community regeneration and development. WMCCE –West Midlands Centre for Constructing Excellence. Short-listed for the “Best Public/Community Project” section in the 2006 LABC National Built In Quality Awards. Judges believed the project to be an outstanding achievement and since the Nishkam team was predominately made up of active volunteers competing at the highest level with professional construction companies was even more rewarding. The Royal Institute of Chartered Surveyors featured the NCA project on its cover page (Issue 172, Sept 2006) and the project received a rapturous review. Carrying the title “Faith will be rewarded”, the article summarised the essence of spirituality and secularity coming together to create something unique, innovative, futuristic yet potent, focused and value driven to make a difference to the community. The Baroness visited the Five Centres for Excellence – Gurudwara, Community Cooperative, Educational establishment, Health and Social Care and Nishkam Centre – and was overwhelmed by the visionary work undertaken coupled with the genuine desire to make a difference to the lives of ordinary people. She saw the Nishkam Nursery and the Primary School – the first Sikh-ethos multi-faith school in the West Midlands. The school which opened less than a year ago demonstrates public opinion by the fact that independent sources show it to be significantly oversubscribed and in demand. Director of the Nishkam Centre, Amrick Singh Ubhi said: “We are pleased the Baroness was able to see the work undertaken here and appreciate her comments and encouragement. She is indeed an asset to the ERDF team and the Upper House; she clearly won the hearts of many of the beneficiaries that she spent so much time with today. For more information on how the Nishkam Centre may be of service to you, please visit www.ncauk.org. To view photos of the visit please click here.